샌프란시스코, 미국의 AAE S.F. 유러피안 호스텔 | 호스텔월드에서 예약하세요. 중대한 위치 - 그레이하운드와 바트 이동 의 이것에 샌프란시스코에서 있는 3개의 AAE 호스텔의 가장 싼 것 입니다 가까운! 9월에 있는 새로 혁신한, 웅대한 재개. 우리는 싸게를 방 당 4와 6을 $59의 개인적인 방 그리고 기숙사 침대를 제공합니다! 가까운 마켓 스퀘어에서 중심으로 위치를 알아내어, 우리의 옥상 발코니에서 샌프란시스코 시를 전망하십시오! AAE S.F. European Hostel은 시장 지역 및 B.A.R.T. (지하철) 그레이하운드 (SOMA)의 중앙 수송의 남쪽, 그리고 Amtrack 역에서 중심으로 사이 도심지에 있습니다. 우리는 아마 당신이 저희의 주위에 거리에 있는 자유로운 주차를 찾아낼 수 있는 유일한 호스텔입니다. 세부사항을 위해 저희에게 연락하십시오! 우리는 버스에 도보 거리, 공항에 달린 기차 및 직접적인 바트입니다. 이것은 당신이 1/2를 위한 공항에서 셔틀의 비용 여기에서 도착할 수 있다는 것을 의미합니다. 중요한 매력 및 대중 교통에 곁에 닫히십시오. 케이블 카, 조합 사각, 시청 의 컨벤션 센터, 어부의 Warf, 샌프란시스코 방문자의 국 및 차이나타운에 도보 거리 안에. I stayed this hostel only for 1night. This hostel is located near civic center so really convenient. And as you know, the price is really cheap here so don't expect perfect and clean facility. For me, I didn't have any complaints about 1night but if you have to stay longer, it would be little bit uncomfortable for you. Staffs are friendly and they provided clean sheets for bed and pillow. I was quite satisfied with here. 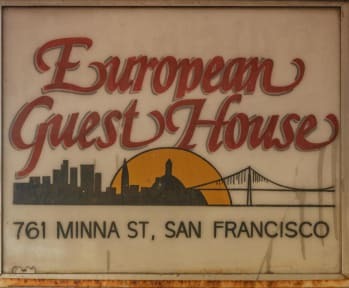 Other hostels in San francisco are so expensive for dormitory room.